Peter Rožič SJ, from Slovenia, has been appointed as new director of the Jesuit European Social Centre. He was also nominated Social Apostolate Delegate for the Conference of European Provincials. Peter Rožič SJ will start at JESC in September, replacing Martin Maier SJ who has been JESC acting director for the past six months since the departure of José Ignacio Garcia SJ who moved to JRS Europe in January 2017. Martin Maier SJ will continue at JESC as Secretary for European Affairs. Fr. Rožič holds a PhD in Political Science from Georgetown University and has been in Slovenia for the past two and a half years, where he was rector of the Residential College in Maribor, professor at the University of Ljubljana and superior of the St Joseph Jesuit community in Ljubljana. In an interview to the Jesuits in Europe website, Peter Rožič SJ said he sees his new appointment at JESC as a “a humbling position of service”, hoping we at JESC “will be able to continue to develop a culture of just and sustainable leadership for a triple mission of (1) the service of liberation, (2) the quest of community, and (3) the spirit of democracy”. 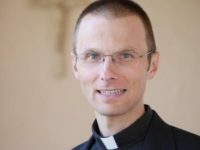 The JESC team is looking forward to welcome Peter Rožič SJ in September and is thankful to Martin Maier SJ for his work in the past few months.